This new Star Wars game is kinda cool. It basically a knock off of another popular game, but with a Star Wars theme, but it’s interesting. No, I am not talking about Bird Shooter Star Wars, nor am I talking about Star Wars Card Battler, nor am I talking about Star Wars Tiny Tower, not even gonna mention Star Wars Clash of Clans or Star Wars Tower Defense. No my fellow iOS enthusiasts, I am referring to the latest Star Wars branded game, Star Wars: Uprising(Free). To the credit of Lucasarts, this has yielded some strong results in the past. Star Wars Baldur’s Gate was pretty cool, Star Wars Wing Commander was amazing, Star Wars Battlefield 1942 was really fun, and even Star Wars Doom was pretty good for its time. Of course, there was also Star Wars Fighting Game and Star Wars Twisted Metal, so clearly the pendulum swings both ways here. I would have to agree with the host of my favorite podcast to sneak onto from time to time(why the RPG Reload podcast of course!). It’s worth taking a game that has merit and pasting in our favorite futuristic space drama that actually happened in the past to see if we can get an amazing game out of it. Truth be told though, I don’t think that this is the game to really bring Star Wars into the action RPG scene. Uprising is a skin stretched a little too tightly over Spirit Lords. In both games you play a character that adventures out and beats up bad guys with a skill that is self targetted, a skill that is aimed, a skill that you tap and drag from your hero, and an ultimate skill that unlocks after a certain amount of combat time. I suppose it shouldn’t be too big of a surprise since Kabam is behind both games, but it’s a bit on the nose for me. Even though the similarity is offputting, the combat is probably my favorite part of the game. I have to confess that for a game I have rated pretty low, the gameplay is fun. Despite random disconnects and taps sometimes not registering at all, blasting through storm troopers and other baddies is (much like Spirit Lords) a viscerally solid experience. Most of the time you have to face of against 4 or more enemies at a time or defeat a powerful boss with various telegraphed attacks. Learning to dodge the telegraphs and shred your enemies is rewarding. The previously mentioned disconnects have happened to me on different devices and on different wifi networks but seem to be a product of the popularity of the game and possible server capacity issues. The non-registered taps are more annoying since you basically have to learn what areas on a map are ok to tap on even though some dead zones are on open floor area. Another thing you have to be careful of is when running away from enemies, never tap near boxes or jars because you will immediately stop and shoot at them, letting enemies catch up and deal damage. I chose to play a blaster toting smuggler/defender hybrid character. Kiting plays a big part of my combat strategy since almost everything I do is just as effective at range as it is in melee. The skill system lets you choose any skill from any class for each of your skill slots. Going with a damage reduction passive, and grenade from defender and caltrops and cone blaster attack from smuggler? Not a problem. The game is fully customizable in that regard and once again I emphasize that combat is probably the best part of the game. The story of Uprising is the age old Star Wars narrative of the imperials trying to be the boss of everyone, this time taking place after Return of the Jedi and right before The Force Awakens. The cool thing is that this is one of the first times this specific period of time has been canonized. The imperials are trying their best to suppress the news of the death of Emperor Palpatine and destruction of the 2nd Death Star, and your character is stuck behind a big blockade put in place to prevent this potentially damaging information from spreading. I have to apologize in advance if this review sounds a little bi-polar. See, I am a pretty big Star Wars nerd. Maybe I don’t know the plot of each of the EU books, but I grew up as many of you did with a love for this franchise and I’ve been a fan through the lean times and am definitely looking forward to movie episode 7 coming soon. 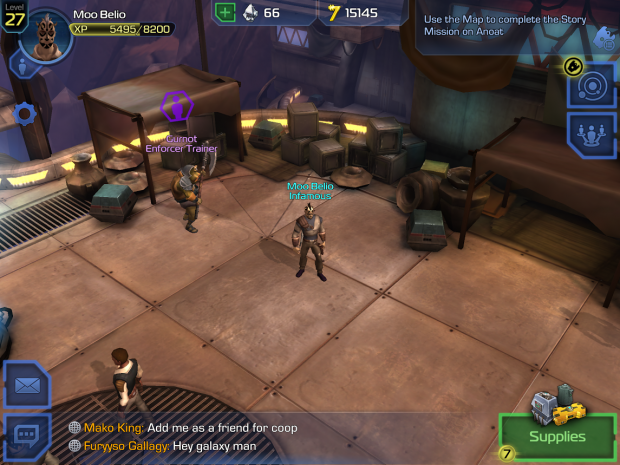 As any good Star Wars fan can tell you, some times a product with the Star Wars label just doesn’t live up to the hype, and I am afraid that in many ways Star Wars: Uprising falls into this category. Everything that doesn’t directly feed into the gameplay of Uprising is, unfortunately, not really that great. The companion system and cartel systems are barebones but functional. The difficulty system will only grant access to the best loot drops for people that already have the best loot in the game(mostly gained via in app gacha style purchases). My biggest problem is that whether you chose to spend money or not spend money, you can only gain experience for about 2 hours each day after day 1. I’ll let that sink in for a bit and explain what I am talking about. There are only certain missions that grant XP. Story missions, assault misssions, opportunity missions and cartel missions all grant it, but are limited. Story missions have a level requirement and by about level 20 you wont be doing more than one or two per day. The rest of the mission types can only be done a certain number of times a day. With a level cap of 40(and a reported increase soon to 100), that leaves quite a few gaps that you might have to wait out on your trip to max level. There is no energy system and whether you spend $0 or $500, there is no way around the daily XP drop off. What seemed like such a great idea, diablo-like with a Star Wars theme, just has a few too many issues for it to work out. 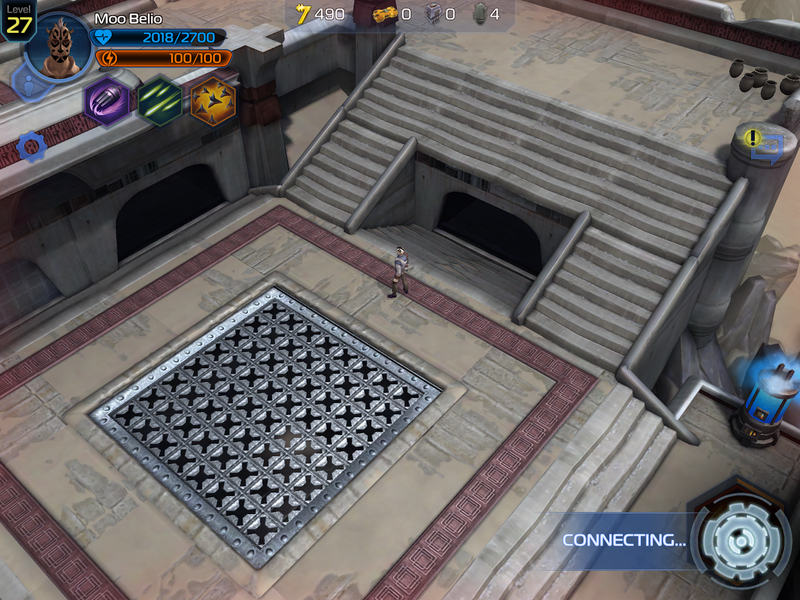 Disconnects(like the one pictured above that forced me to restart the entire level after already clearing it), random tap target dead zones on maps, loot drop rarity restrictions and a strangely obstinate XP system all come together to undermine what could have been. I am a sucker for ARPG games, and I really was hoping Uprising would be able to evoke some of the feeling I get when playing my favorites. I think with some updates it has the potential to improve but until then Uprising is going to be in the ‘miss’ column for me. In the mean time leave a comment below and tell us which genre you want to see Star Wars in next! I’m pulling for either Star Wars: SRPG or Star Wars: Super Hexagon. 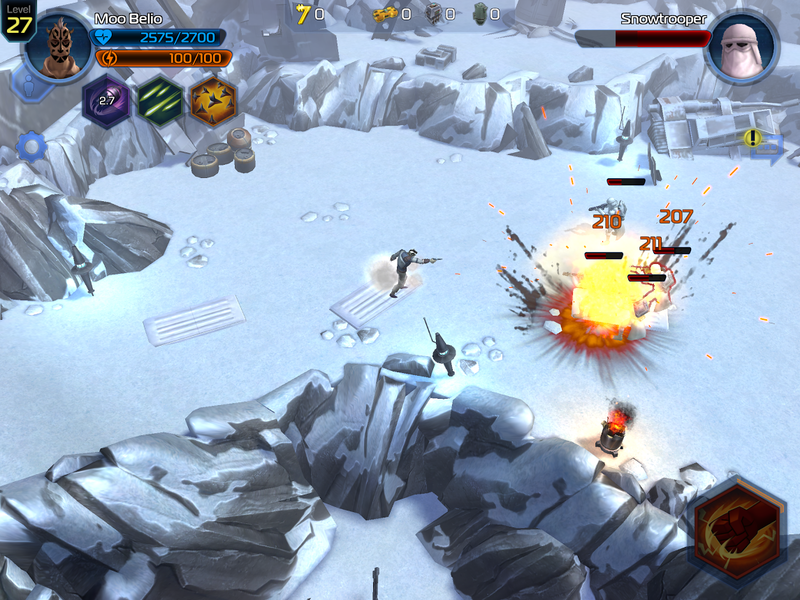 Next PostNext ‘Rebuild 3: Gangs of Deadsville’ Review – Can I Kill One More Zombie Mom, Please?